I sometimes dream of putting on an outfit that brings out my inner hippy. I love the white lace that always seems to be front and center in so many bohemian outfits. It’s also the only style I know of that has so much crochet! I went on a hunt for knitting and crochet patterns that feel bohemian and free-spirited to me. How adorable is this?! I want to make 10 of them… but first I need to learn how to braid my hair like that. I love Andrea Mowry’s design style. The things she designs are simple in a way that I could imagine wearing all of them with my own, current wardrobe. Like this yoga shawl. Can I just wrap up in it? This top looks so comfy. I love the way that it’s open and oversized. I think I may have gasped when I saw this and then to see that the pattern is free…! I love that this is knitted, as it has a different look than a lot of the boho tops you see (crocheted in white). Super cute, though I couldn’t get away with wearing a crop top. I can imagine so many different color combinations with this bracelet, or maybe making it a bit smaller using thinner yarn and a smaller crochet hook. Also, sitting at a computer all day, I find hard bracelets to be a bit cumbersome, so a soft bracelet like this seems like it would be rather comfortable. Is it a skirt or a poncho? A soncho? A spirt? No… I’m glad Flora didn’t try any of that for this pattern name. This crocheted skirt looks perfect for the beach! I’ve put together some extra inspiration on this Pinterest board, not all pointing to patterns, but eye-candy nonetheless! Enjoy! 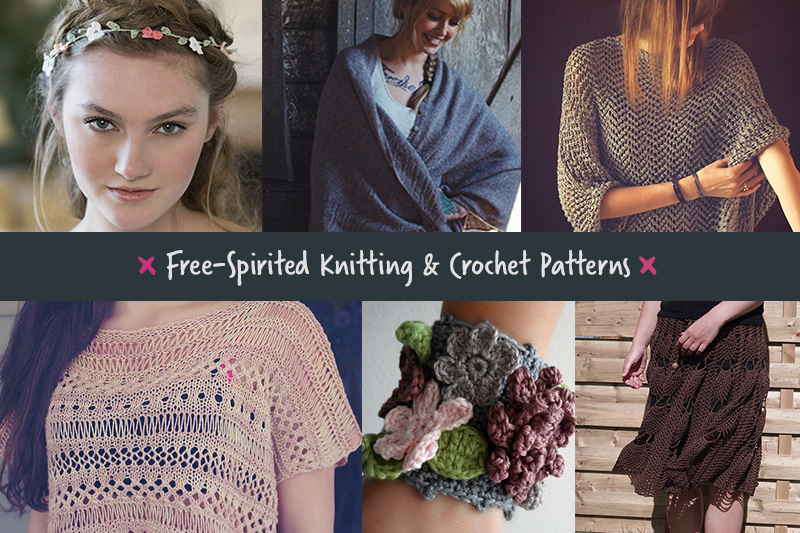 Follow Mandy’s board Inspiration: Funky, Free-spirited Knitting and Crochet on Pinterest. Next PostNext Stress Less – Knit or Crochet!